211OC is working to become the health and human services backbone of Orange County by identifying the needs of the most vulnerable in our county, bringing resources together to meet those needs, and advocating for systemic change to effectively and permanently eradicate those challenges. Through our three core competencies, Connect, Collaborate and Inform, we have become a leading convener of service providers across the region, a main stakeholder in countywide collaborations, and an advocate on behalf of a more efficient regional communication and data collection system and infrastructure. care, employment services, and a wide range of services vital to individual and family self-sufficiency. 2-1-1 Orange County runs a comprehensive information and referral system for Orange County, CA. 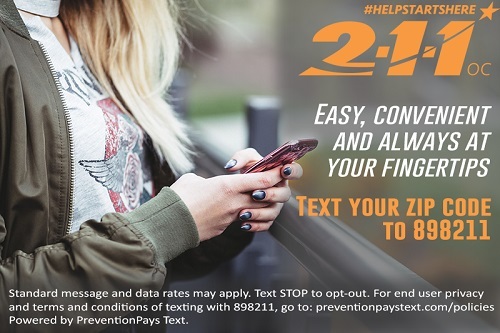 211OC provides a resource database of over 3,000 health and human services and support, accessible 24 hours a day, 7 days a week online and through our multi-lingual hotline, connecting people quickly and effectively to existing programs and disaster response information. Just dial 2-1-1 or 888-600-4357 (toll-free) to receive referrals from trained multilingual I&R Specialists 24 hours a day, 7 days a week.